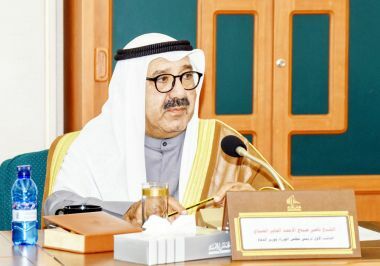 KUWAIT-- First Deputy Prime Minister and Minister of Defense Sheikh Nasser Sabah Al-Ahmad Al-Sabah said Sunday the northern economic zone law, which is still under discussion, does not violate Kuwait constitution. This came during a joint press conference on the government program of action, north economic zone and New Kuwait Vision 2035, at the National Assembly, after his meeting with parliamentary financial and economic affairs committee, in the presence of Speaker Marzouq Al-Ghanim, Minister of Justice and Minister of State for National Assembly Affairs Dr. Fahad Al-Afasi and Central Bank of Kuwait Governor Mohammad Yousef Al-Hashil. The law of the northern economic zone must be flexible enough to attract investors, Sheikh Nasser said. Many issues in the law are still under consideration before a final version is referred to the National Assembly for a further discussion in weeks' time, he said. Sheikh Nasser expressed hope that both executive and legislative authorities would complete the study of the law in the coming weeks. Number of members from Supreme Council for Planning and Development, board of trustees of the north economic zone and the Executive Director Developing Silk City and Boubyan Island Faisal Al-Medlej also attended the meeting.